Re-installing or Upgrading AnyOrder. . . Upgrading & Re-installing AnyOrder. . .
1) Back-up Files. Make sure you have backed-up your files. This normally is done at the end of every session, but for an install, you should give yourself an added measure of security and back-up your files to a second directory or flash drive. a) Any graphics files (*.bmp) that you are using for logos on your invoices, billings or royalty reports. In other words, if you have a logo on your invoices, make sure that you have a copy the logo file stored away some place. If not, look for *. bmp files in C:\AnyOrder and copy all of them to your back-up directory or flash drive. b) Any Internet Macros (*.iim) that you have created or altered. If you haven't created any Internet Macros, you don't have to worry about this. c) Any forms, documents, mail merge letters or label lay-outs that you've created in Microsoft Word and are stored in the C:\AnyOrder\My_Files or C:\AnyOrder\Labels directories. If you are unsure of this, copy each of these subdirectories to a back-up directory or flash drive. a) The file BSetUp.dbf include a number of local settings, including the path to the common data directory on the server. b) Forms, documents, mail merge letters or label lay-outs may be saved on the local computer on the following local directories C:\AnyOrder\My_Files or C:\AnyOrder\Labels. c) Additionally, Labeling.dbf includes quite a number of settings related to creating labels. NOTE: The new version of AnyOrder (Version 14 or greater) has a handy feature which will back-up the above files. If you are using AnyOrder on a Network, this feature will also save your local network settings for each workstation. To access it, select File >> Local Back-up & Restore. Select the "Back-up" option to back-up files. When you do a clean install, it's doubly important that you have an extra back-up of your data. Do not proceed until you have made two (or three) back-ups to different directories or flash drives. To un-install the old program, click on the START button on the Windows desktop. 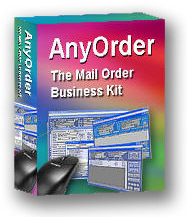 Find the AnyOrder listing and select the "Uninstall" option. At the end of the un-install process, the program will display a list of files to be deleted. Double check the list and make sure that it's okay to delete all of the files. If you see one or more files that you don't want deleted, skip this process. Note: With some systems, you may find that you are unable to access the "Uninstall" application. In that case, you can uninstall the program simply by deleting the entire C:\AnyOrder directory. We use this technique frequently on our test machines. It is a simple way of uninstalling the program. Since AnyOrder makes very few changes to the registry, it does the job. Once the program has been uninstalled, you can install the new program. Specific directions on downloading and installing the program are found here: Installing the Program. 4.) Regular Install. If you are not doing a clean install, you can install the new program over the old program. It is not necessary to uninstall the previous version. Even though AnyOrder will preserve your data files, you still want to make two back-up disks as a precaution. Specific directions on downloading and installing the program are found here: Installing the Program. 5) Rover Users. If you have AnyOrder Levels V or higher, are using the Rover Module, be sure to download and re-install the newest Module. The Rover Module is coordinated with the main program, and the Rover Module should be updated at the same time that you update the main program. 1) If you've done a "clean" install. In other words, you have un-installed the old program. 3) If you are installing the program to a different directory than the original. To do a restore, select FILE >> RESTORE BACK-UP FILES. (If you haven't done a restore before, click on the "Help" button on the Restore dialog box and you'll find detailed information.) Once the restore process is complete you'll have access to all of your own files. If you using AnyOrder on a network, it is highly recommended that you do the restore process on the server. Once you've restored the backed-up files to the server, start the program on the server. This allows the program to make any necessary database changes - and it allows you to view to the data and make sure everything came through fine. You only need to restore the data on the server. It's not necessary to restore the data on the workstations. Once installation and restore has been completed on the server, install the program on the workstations. If you have used the local back-up feature found in the Version 14 program, you'll can restore any local files, and/or your network settings. To access it, select File >> Local Back-up & Restore. Select the "Restore" option to restore local files. If you weren't able to use the local back-up feature, you'll want to copy the files (if any) from step #2 above to their respective directories. If you have done a clean install, then on each workstation, you will need to re-set the path to the server computer. (This is not necessary if you have done the Local Restore described above.) More information is found in Help, but basically, after installing the program on a workstation, you need to start the AnyOrder on the workstation, select File >> Basic Program Set-up and Preferences, click on the Network/Currency tab, and click the browse button and find the AnyOrder directory on the server. 8) Registration Code. If you have installed a new version over the old version, your registration code will remain. Also, if you use the restore process, your registration code will be brought in along with the other data files. Thus, if you are not upgrading to a new level, there's no need to re-enter your registration code. However, if you are upgrading to a new level, and you have received a new registration code, you'll need to enter the new code. Wait to enter the code, however, until after you've completed the restore process. As mentioned above, the restore process will bring in your old code. If you enter the new registration code first and then do a restore, it will be replaced by the older code. Of course, you can just re-enter the new code, but it's simpler all around to do the restore first and then enter the new code. To enter a registration code, select HELP >> ENTERING OR CHANGING YOUR REGISTRATION CODE. Type in the registration code. Note that the registration code is keyed to your company name, and you'll want to make sure the company name is exactly the same as the name you used when you registered. The spelling must be exactly the same. Abbreviations such as "Co," "Ltd," etc. must be the same. And punctuation must be the same (such as the period in "Inc."). If you change your company name in any way, contact us, and we'll be happy to provide you with a new code.